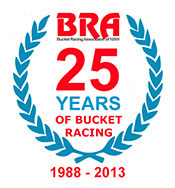 The Bucket Racing Associations 25th Anniversary celebration weekend was a terrific get-together of previous and current Bucket Racers. The planned ride had to be cancelled as the rain just pummeled down. However an excellent Dinner laid on by BRA President Ken Lindsay and his Mom Doreen and plenty liquid refreshments set the scene for a great evening that went on well into the night. Sunday morning back to Kens place for an excellent breakfast and some more conversation ranging from serious to hilarious. However the weather refused to play ball and by midday everyone headed home. Many Thanks to Ken and his Mom Doreen for their excellent meals and hospitality. Rounds One and Two of the 2013 PCRA BRA Bucket Championship. Click Here... For Round 1 or scroll down this page. 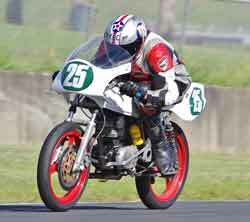 Round Two of Bucket Championship at Sydney Motorsport Park South Circuit. 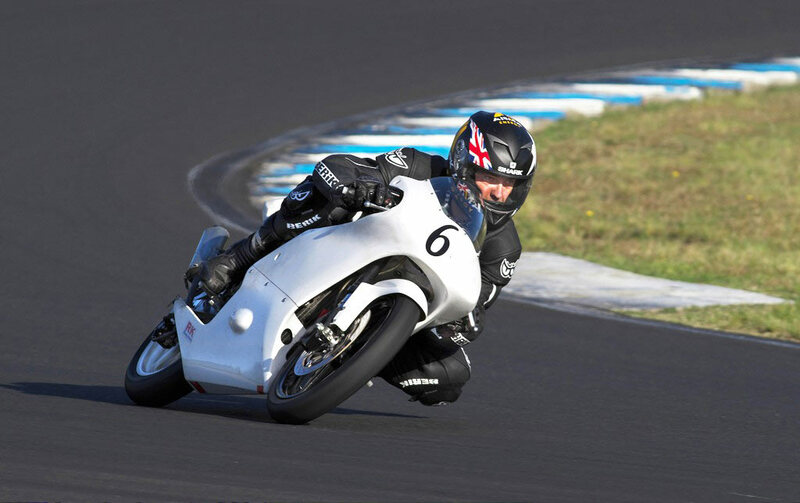 The second round of the 2013 PCRA BRA club championship held on the South circuit at Sydney Motorsport Park had it's share of delays but as usual the racing in the Bucket Classes was excellent. The Commuterlite class had it's own race with 20 bikes now entered in this rapidly growing class. For a spectator it was engrossing watching the line of Commuterlites snake around sounding like WWII bombers flying low overhead. The second race had extremely close racing with Ryan Young(20) 1st, Mick Johnston(62) 2nd and Nicolas Wenban(48) 3rd all finishing within 0.5 second at the end but all looking for an advantage into each corner due to differences in gearing and style. A following group consisting of Ron Pulido(136), Andrew de Jersey(42), and Anthony Marsden(86) all vying for 4th had a similar race. All were riding Honda CBR125's. 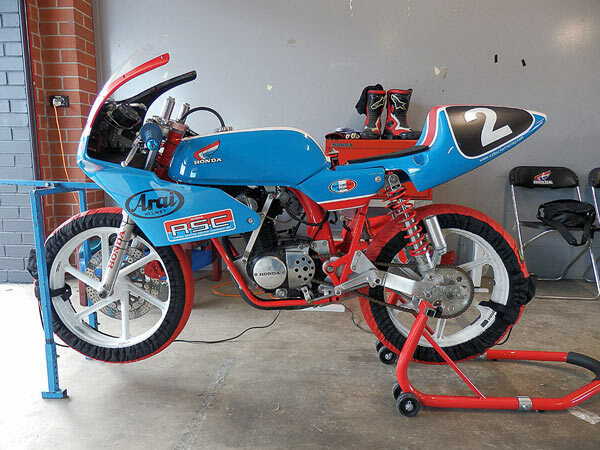 In both Motolite races Jason Dunn(6) on his 2 stroke RS85cr took the chequered flag from Stephen Kairl(79) on the Big Bang Engines RS150CRFr who was getting used to the Phantoms booming green 4 stroke with, Paul Borg sitting out both races. Andrew de Jersey(42) (4 stroke CB200 )and Shane Wilcox(68) (2 stroke RS85cr) swapped the next two positions in each race highlighting the well honed Motolite formula. Superlite PRO: Walter Murphy(38) Honda CB150 gave a master class on the tight circuit putting it to some of the Motolites beating Ian Gregory(169) in race one. Ian got home first in the second race of the Superlite PRO, the emerging pattern is repeated with Ken Lindsay(2) Honda RCB150 and Tim Smith(65) Honda CB150 swapping honours for 3rd in the two races. Superlite AM: Micheal Lemon(26) Suzuki GS150 finished 1st in the Superlite AM class following a mistake from Ryan Philips(25) Honda 150 who claimed 1st in the second race with Micheal holding off a charge from Martin Kraaymaat(4) Honda CB125 Twin to take 2nd. Click Here for Round 2 Results Table. Round 1 of the 2013 PCRA BRA Bucket Championship. 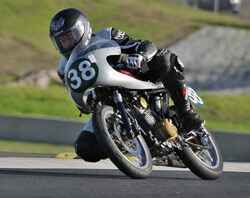 Jason Dunns 2013 Motolite season got off to a great start with 2 race wins and maximum points score. However he didn't have it easy in race one with a sluggish start saw him in 3rd place behind #93 Paul Borg (Sculley Honda RS85cr) and #43 Dan May (Honda RS85CR) with Andrew De Jersey (Big Bang Engines Honda RS150CRFr) next. Dan May did not come around on the next lap so this moved everyone behind him up one spot. Jason got his head down and reeled off 3 consecutive fastest laps creating the first lap record time of 1:17.8710 for the new North circuit pipping Paul for the win by 0.2 sec. Andrew De Jersey getting to grips with the Garry Briggs (Big Bang Engines Honda RS150CRFr) came 3rd followed by #4 Justin Hall (Honda RS85CR) for 4th. 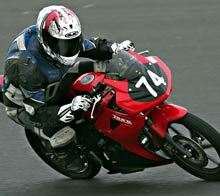 In Race 2 Jason made no mistake and was never headed to score maximum points on the day. Defending Champion Paul Borg finished 2nd. in both races 2nd overall not a bad start to his title defense. #43 Dan May tussled with #42 Andrew De Jersey breaking clear on lap 3 and closed in on #93 Paul Borg, but in the end was half a sec. down. 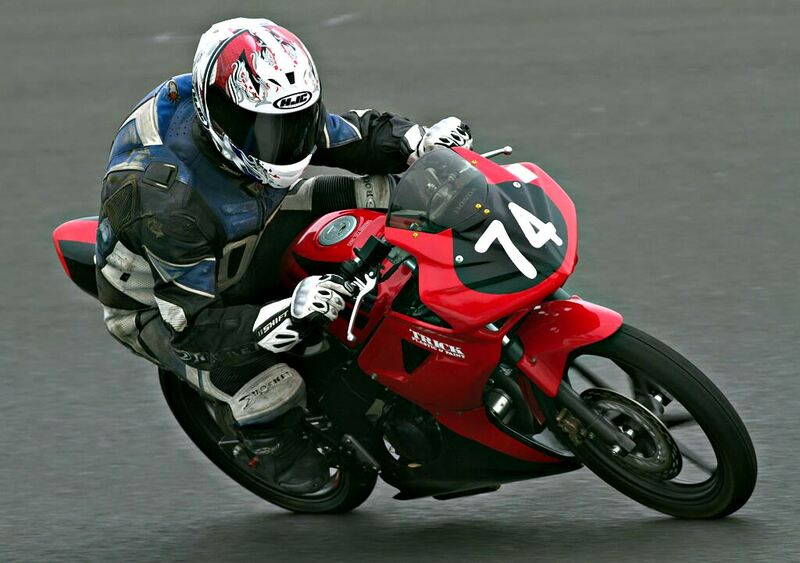 #42 Andrew finished up 3rd overall enjoying his outing on the Green Big Bang Honda. #38 Walter Murphy (Honda CB150) set the first Superlite pole for the North circuit at Sydney Motorsport Park. 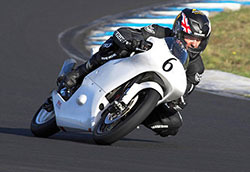 He then went on to win the first race and finished 2nd in race two to take out overall honours for the day. In race one #2 Ken Lindsay (Honda RCB150) on his brand new bike came in second . Next up was a rejuvenated Martin Kraaymaat on the Honda CB125T twin followed by #169 Ian Gregory (Honda CB150) and #65 Tim Smith. Defending Superlite Pro Champion Fred Holland didn't get to the start line as during practice his motor started to blow smoke out the breather pipe accompanied with a big loss of power, so he was out. Not a good way to start his title defence. In Race two Walter got away well but Ian Gregory who had made a change to his gearing in between races was running strongly and on the final lap he slipped through and pipped Walter to the line. #2 King Kenny got embroiled in a battle with some Motolites and lost touch with the leaders but still came in 3rd giving him 3rd place overall, Not a bad christening for the new bike whose engine was only started before being put on the Trailer to come to the meeting. 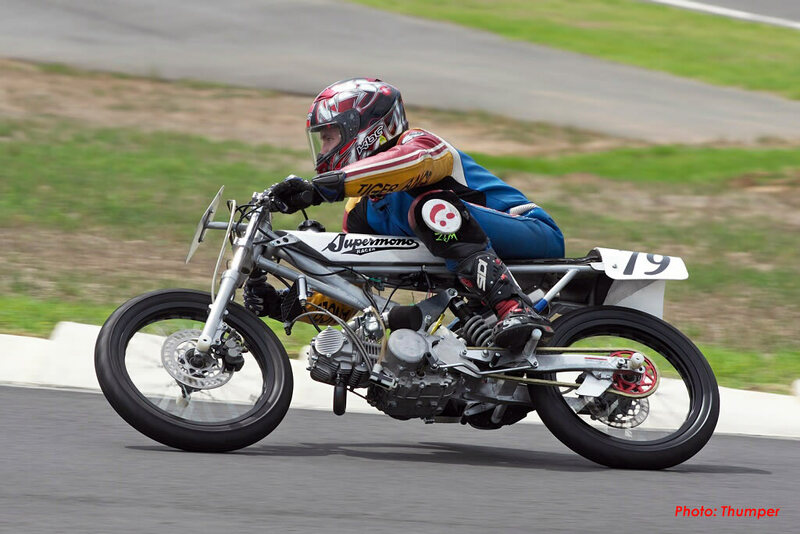 Young Ryan Phillips (Honda CB150) dominated the Superlite AM class with 2 wins and was mixing it with the Superlite Pros riders. #41 Dan Harrison (Honda CB150) came in a strong second with #39 Greg Potts (Honda CB150) getting 3rd. #101 Wes Bull on his uniquely painted (Honda H100) came in 4th ahead of #31 Duncan Taylor (Kawasaki KH100). #88 Mark Robertson did not finish the first race and didnt get going again so no championship points for Mark. In Race 2 Ryan was untouchable again showing great speed and continued to bother the Superlite Pro riders. Dan Harrison had found a good turn of speed and was much closer to Ryan in the second race. Greg Potts came home a solid 3rd with in fact the same finishing order as with the first race. Note: Ryan Phillips grading is under review by the BRA Committee, More info when available. The biggest entry yet for Commuterlites (16) took to the grid and as usual they didn't disappoint. 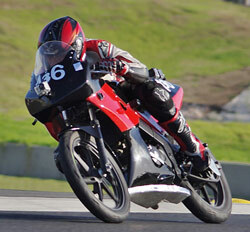 #136 Mayo Ron Pulido (Honda CBR125) had his maiden win. Ron won both races in commanding style with current Champ #20 Ryan Young (Honda CBR125) second from a fast improving #86 Anthony Marsden (Honda CBR125). Newcomer to Commuterlites Roger Quinlan adapting quickly to the Commuterlites finished 4th on his first outing in this very competitive class. #18 Jack Robinson (Honda CBR125) and #72 Trevor Berrange (Yamaha YZFR125, the lone Yamaha) tied on points with Jack getting the nod as his best result came in the last race. Down through the field quite a few battles were going on with some exciting dash's to the chequered flag. 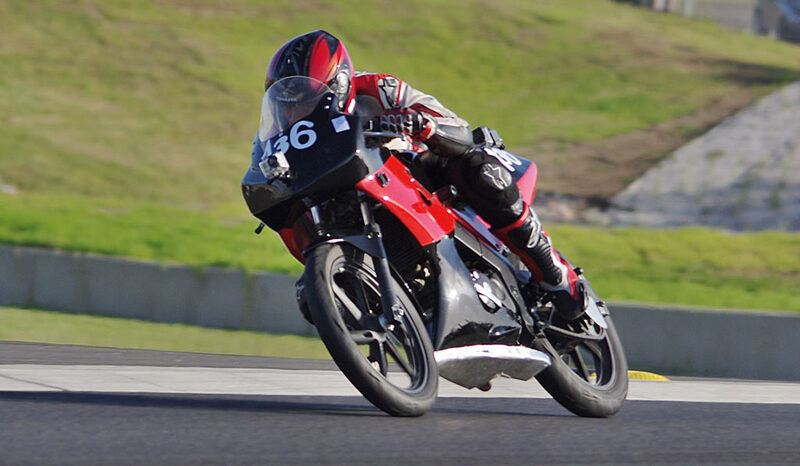 With 8 additional riders starting in the Commuterlite Class and for some of them it was their first race on tarmac they all acquitted themselves well on the first round of the 2013 PCRA BRA championship. 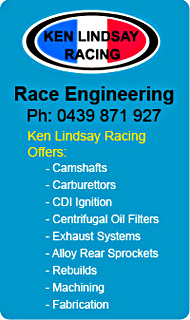 The Commuterlite class continues to grow with each outing, it's the cheapest way into any kind of motorsport. Oliver Higgins, Roger Quinlan, Rez Mark Pulido, Tony Martin. Ken Lindsay's new Superlite beautiful engineering lots of hours went into this one.